Often we look so hard at the tulips we miss the garden. 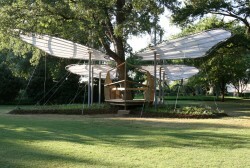 Below are photographs from the recent opening of the Dallas Arboretum Ultimate Tree House exhibit that allows us to see how architects are able to explore, evaluate, and direct our attentions to the gardens, hardscaping, paths and trees so we can better see and experience the Dallas Arboretum. These structures allow a person to hide from the outside world, and, yet see the outside world with a clearer vision. Many employ a bris soleis that looks dense from the outside and transparent from the inside. Other open structures are like a simple platform in a tree. A platform seems quite exposed from the ground, but once you are safely on it, it becomes a world of its own. The tree houses are not nearly as much about themselves as they are about the Arboretum. Thematically or structurally, they blend into the gardens. Ten foot to 30 foot brightly colored structures would seem to visually shout out their location. They don’t. You actually have to go looking for them. Here are my thoughts on the ones I could find. A giant butterfly might intellectually be implausible but its grace and thematic content makes this tree house design seem like a visual requirement for any self-respecting garden. FlutterBy is an interactive experience that incorporates nature and design. The garden is a delicate arrangement of vibrant annual color which attract the butterfly. A pathway through allows for individual exploration. The large floating wings above provide shade to the structure below. The form celebrates the metamorphosis from caterpillar to cocoon into the fluttering by of the butterfly. Special thanks to our construction partners: CONTRACTOR - J.E. Dunn of Texas: Nick Abay, Kathy M. Fetters, Shannon Jones, Terry Loreth, Patrick Peaden, Mike Russell & Bobby Snyder. The materials, structure and theme of this tree house subordinate it to the gardens. Basket woven bamboo around the tree reflecting the shape of the sprouting tree limbs provide us with a tree house accentuating the tree and reminding us of a known garden object. The dense and solid exterior really serves as a transparent bris soleis when you enter this tree house filled with light. Designer: Chuck Armstrong, AIA, Corgan Associates, Inc. 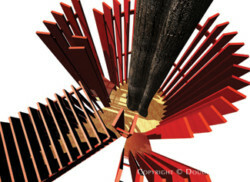 The design of this tree house is inspired by primitive basket weaving. The choice of bamboo as the primary material was influenced by my childhood memories of the Camp Estate being surrounded by a dense bamboo thicket. Before the arboretum was created, this thicket attracted millions of blackbirds each evening to roost. The weathering of the organic material from green to straw color during the six month installation will signal the transition of seasons. The rope used is nylon and will retain its bright color for the duration of the exhibition. The basket will be kept open within its interior to create an interesting experience looking up and around the trunk of the tree. The steel superstructure is a “tensegrity frame”. In other words, it acts as a self supporting element much like a basket or lamp. 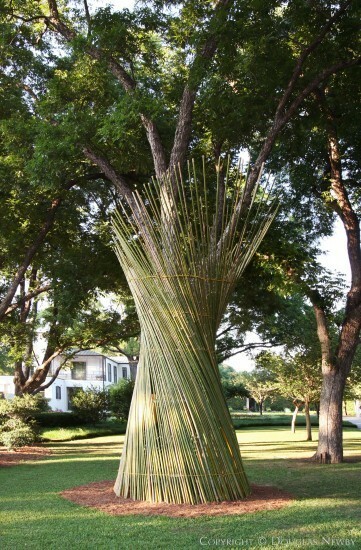 The basket is designed to conform to the general shape of the tree. The top is shaped in response to the limbs and overall form of the tree. 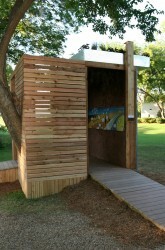 The Underground Tree House explores the idea of what it feels like to be ten feet underground. From the outside, it appears as a simple cube of Plexiglas with wood cladding. The roof top garden serves as the only hint that something out of the ordinary is happening. Upon entering the cube, a completely different story is told. Roots flourish above your head, a dirt wall anchors the structure and whets your appetite for the next engaging experience. Another wall, filled with educational marvels, demands your attention and captures your imagination. Take a look through the periscope and view what ants and other insects would see if they were meandering through the above rooftop garden. As you exit the Underground Tree House, you can’t help but want to explore it again. This open structure appears very exposed and public, and yet it is a good example of the similarity to ascending a platform in a tree house to find a very personal and private space. Accentuating this sensation is a series of periscopes that, in this case, go high into the branches. These multi-color periscopes ascend the tree for you. Replacing a conventional rope ladder, stucco blocks climatically draw passer-bys into the tree house. A beauty that is only present in natural surroundings encourages onlookers to pause. Beneath the weathered aluminum canopy, restless souls find nourishment. Yet, the open construction invites recreation. Once inside, playfully hued periscopes rouse the imagination, magically elevating one high into the branches. These portholes provide a revitalizing escape to the outside world. Views from this fresh perspective reawaken a hidden peace. However, this transposition is not a mere diversion sought in blind naivety. 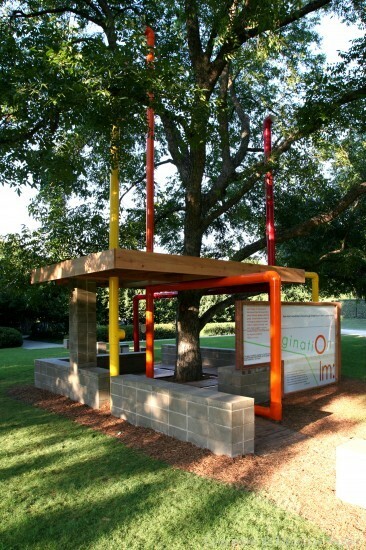 Rather, the same colorful steel tubes descend from the tree’s canopy, morphing into supporting trunks and anchoring roots. It is here, engaged in the dialogue between fantasy and reality, that we are able to obtain a portrait of completeness. Ultimate Blooms tree house is a series of tulips that might remind a person of their favorite organic hiding place. The widely spaced slats do not conceal someone completely, but enough that a passerby distracted by the hustle and bustle of the world would not discover them. Someone, while hidden and camouflaged by the petals of flowers, leaves of a tree, or other organic material, is free to peer at the world around them without judgment. The design allows the patron to directly participate in the actions of a butterfly or similar insect as they become the “Pollinator” and move within the three tulip blooms. This concept creates both a visual and educational experience. The tulips are connected by a wheelchair accessible ramp and elevated pathways, as well as steps to provide movement between the blooms, simulating pollination. Bolted, plywood ribs stand 11 feet tall and represent “nectar guides” radiating from the tulip center which will draw “Pollinators” to the flowers. The plywood ribs are in-filled with painted wood slats just as visual cues such as color in flowers attract certain “Pollinators”. The slats are also angled specifically to create and control the visitors’ view from within the tulips. 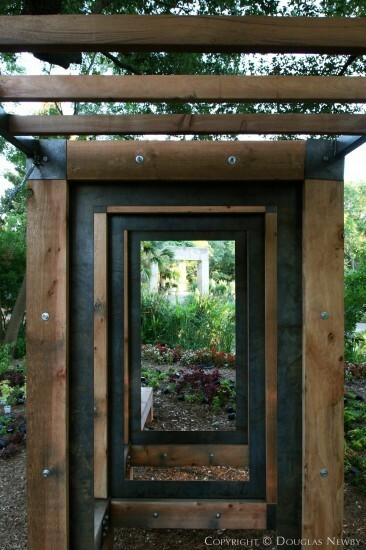 Frame Work reminds me of the work of the late great modernist Bud Oglesby. Whether it’s a townhouse or a mansion, Oglesby always designed his houses around a framework running the length of the house, opening to a beautiful view of water, bluffs, gardens or trees. Here you have your views framed without the distraction of single purpose rooms nearby. The project is a sculptural and interactive piece, incorporating a linear site line between the tree and the adjacent limestone terrace that consists of several water features. The “viewing concept” is experienced through a series of picture windows that facilitate the idea of duplicity of views between the tree and the terrace. 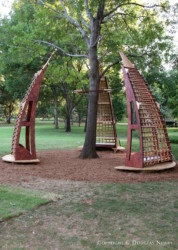 The built structure includes a covered sitting area, as well as sculptural elements and features that are created to be enjoyed by children and adults alike. Square of Circles is a magnificent tree house erupting out of the forest. How you get in or out is only solved by a leap of faith. A push on one of the yellow pipes reveals they are hinged, allowing ingress and egress. Again there is a transparency between the outside and inside, but once inside you feel protected. This tree-room is an interactive sculpture defined by four walls of yellow pipe and a natural ceiling of branches & leaves. 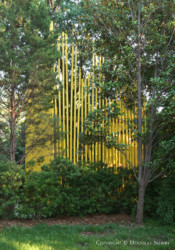 Each yellow pipe projects upward until it encounters a branch, so that each one is a different height. The pipes are hinged on a pivot so that visitors may push them aside and walk between them. The form and shadows are designed to move with the breeze and evolve throughout the seasons. Dedicated to Mom. How else would you expect a beautiful specimen tree to grow but in a 10 foot pot watered by a 12 foot metal watering can. From a distance, these objects are so familiar and in scale we have to move closer to examine our discovery of a tree house and the fun it offers. What would it feel like to stand up next to a tree and feel like the size of an ant? Using scale and perception, an ordinary tree can become a place to stretch one’s imagination. The Potted Tree re-creates the ordinary objects required with maintaining a potted plant and allows both children and adults to experience these ordinary objects in a rare way that becomes extraordinary. Looking at the design from afar, the tree is scaled down to the size of a potted plant. The size of the pot and the watering can are proportional to the size of the tree. This makes the pot 10 feet tall and the watering can 12 feet tall. Changing scales transforms the tree into a fantasy place that attracts the curious. We would also like to acknowledge Johnson County Foam. A 220 year old bois d’arc tree with sprawling, sprouting branches and gnarly texture full of permutations and imperfections deserves to be a tree-house. 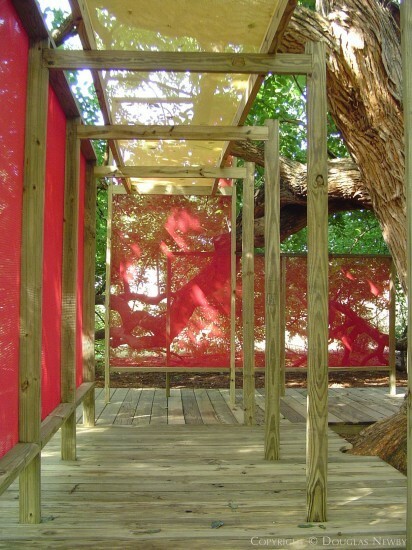 A red nylon fabric used for athletic equipment bags is stretched on a frame to create an entrance and the personal space of the tree. Entering this space, you are forced to look toward the tree as you circle it – awed by its age, character, history and strength (bois d’arc is used for foundation piers as termites cannot even penetrate it). When you look away you look through the red nylon mesh as if you are seeing the Arboretum through rose colored glasses. The French have a word for “so ugly it is beautiful,” jazz musicians compliment “a dirty voice,” applauding its character, not clearness. An arborist should coin a word for a tree ravaged and yet resistant to time, strong, but nearly forgotten. Designer: Reynaldo Herreros, Corgan & Associates, Inc. Shelter and house have been synonymous to most of us since our earliest memories. In the world of imagination for both young and young at heart, a tree has many times been a house. Many have sought the cool shade of a tree on a hot summer day and sometimes sought its shelter from the harsh wind. Surprised by a spring shower, we have huddled near its trunk to shelter us from the rain. Artificial elements have been used to define space and complement the natural definition of volume already created by the tree branches and leaves. These artificial planes join the natural play of transparencies set up by the branches and leaves. 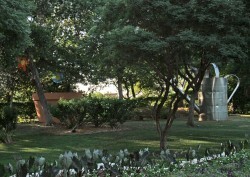 The tree’s branches also set up natural entry points and barriers. The colorful planes accentuate this naturally occurring order. Natural, artificial, ephemeral, permanent, translucent, opaque, protective and revealing all complementing and contrasting each other to reveal a unique experiential perspective for the visitor. Is the tree the house or is the house the tree? In the end, the answer to this question is not as important as is our experience of the “Tree-House”. Climbing trees make a person increasingly aware of smaller and smaller details of its structure as the limbs become smaller and the leaves become more abundant. The leaf structure of this tree house allows you to imagine if you are ascending to the smallest edges of a tree where you stop and make your home. By day, this green structure totally blends in with the background. At night, illuminated with white light, it glows. Beyond the typical four walls, floor and ceiling, a tree house is the adventure, the experience, a child’s escape from an adult’s structured world. The concept of “tree house” often evokes thoughts, memories, history, and imagery of childhood and parenthood: activities and learning, the act of construction and personalization, nature and our relationship to it. But, traditional form and materials often confine the limitless imagination. The leaves of the tree provided the basic form for our design. 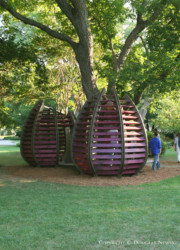 Through the use of parametric 3-D modeling software, the basic “leaf” surface was generated, and transformed into the “wall panels” that create the tree house. Precision in fabricating the components, as well as being able to accurately quantify the construction materials, makes these very organic, expressive forms, feasible to assemble and install. To represent the personalization of the tree house, area school children crafted their own “leaves” to be hung inside the house. The leaves draw the eye upward and engage you with wind, sound and sky. 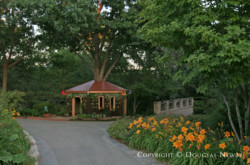 Arbor-Tropism reminds us that people and nature seek out trees to find shelter, to lean against, or just to sit under. This structure points to and embraces the tree from a slight distance, the distance we often gravitate to a tree. 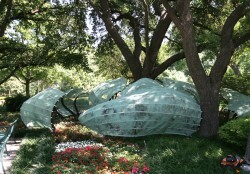 Organic structures representing an attraction to nature form a protective embrace around the tree. No physical contact is made, yet feelings of aspiration, tension and Henge-like revelry abound. This design was born from the basic ideals that drive any sanctuary of nature – the primal attraction of people towards their natural environment. Organic forms forged out of both natural and manmade elements coexisting in harmony. Casa Musgo is the house most organically intertwined with the tree. While man-made, the planned structure, natural environment, and planted flowers all blend inside and outside of this tree house. Designer: Elizabeth Smidt, A.S.L.A., Great Gardens, Inc.
Casa Musgo (Moss House), is inspired by nature itself. From the outside one sees a rush of color from the perennials and the jewels that adorn the windows and rooftop. Your attention is next drawn to the ivy that trails upward and intertwines as it reaches for spider plants that drop from the upper edge of the walls. Finally your focus is captured by the cooper roof that over time will patina to the earthy color of the walls around it. Since this house is created with nature in mind, it does not distract from, but rather adds to the natural beauty of the tree. This enticing tree house was one I didn’t discover. What a great reason to go back to the Arboretum. Designer: Jason Oliver, Corgan Associates, Inc. CORE provides us with a window looking in on a moment during its relatively slow life. Its vertical walls, inspired by the nature of the light passing through the bamboo, cut a path providing access to a hideout within the tree’s shade. CORE was created through the manipulation of light, scale, density, and the filtering effect of its surrounding environment. These walls provide a separated yet transparent place which visitors may sit and enjoy the age, texture, and presence of the tree.